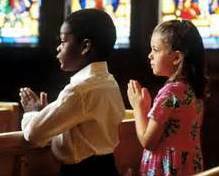 " Prayer itself, born in Catholic families, nurtured by programs of Christian formation, strengthened by the grace of the sacraments, is the first means by which we come to know the Lord’s will for our lives. To the extent that we teach young people to pray, and to pray well, we will be cooperating with God’s call. Programs, plans and projects have their place; but the discernment of a vocation is above all the fruit of an intimate dialogue between the Lord and his disciples. Young people, if they know how to pray, can be trusted to know what to do with God’s call."